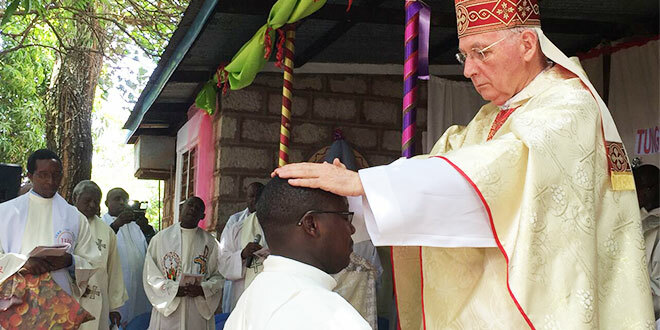 FATHER Alexander Munyao, ordained in Kenya earlier this year, is now ministering in the coastal town of Ballina as Lismore diocese’s newest priest. Writing for the diocese’s magazine, Catholic Life, Fr Munyao said his “call to the priesthood started when I was a young boy growing up in the Savanna Plains of Kenya”. He returned to those plains earlier this year for Lismore Bishop Geoffrey Jarrett to ordain him. That followed “twelve good years of formation”from 2004, starting with five years of philosophical studies at Consolata Institute of Philosophy and Novitiate in Kenya under the Consolata Missionaries. Fr Munyao then had three years of theological studies at the Pontifical Urban University in Rome followed by four years intensive study and pastoral experience in Australia under the guidance of both the Good Shepherd Seminary, Sydney, and Vianney College, Wagga Wagga. Lismore and Wagga Wagga dioceses had representative priests joining Bishop Jarrett at the ordination at St Zeno Catholic Parish, at Ndithini in Machakos diocese, Kenya. “The spectacular Mass was conducted in English graced by a mixture of angelic liturgical songs in Swahili (second national language) and Kamba (my native mother tongue), one of the 42 tribal languages spoken in Kenya,” Fr Munyao said. “With hundreds of people in attendance, even our best effort to hire marquees, a public address system and chairs was not enough. The ordination ceremony took three hours, including more than half an hour for the Offertory procession. “Unlike the celebration of the Mass in Australia, the Offertory here is often accompanied by the literal presentation of gifts,” Fr Munyao wrote. “Everyone takes turns to present his or her offertory and gifts to the Lord at the altar. Gifts range from animals, groceries to farm produce. Bishop Jarrett, in his homily, said “I am very moved by this very large and joyful assembly and the beautiful and impressive preparations that have been made for today’s celebration”. He told the new priest he was being called “to a life that will be full of all sorts of tests and challenges”. “We pray that the life which commences today with this laying on of the bishop’s hands, will be a life also of unfailing joy in the Lord, whose strength will support you at every moment along the way, a way that leads to your mission in distant Australia and to the warm welcome which you already know awaits you in our Diocese of Lismore,” Bishop Jarrett said. Fr Munyao wrote that he first felt the call to the priesthood growing up in his local parish, which was “being looked after by Irish missionary priests (of the Holy Ghost Fathers)”. “I was utterly touched by their sheer determination and call of duty, to spread the word of God despite the deplorable conditions under which they worked, including their undeterred efforts to master my local Kamba language,” he said. He is fulfilling that call as an assistant priest in Ballina.